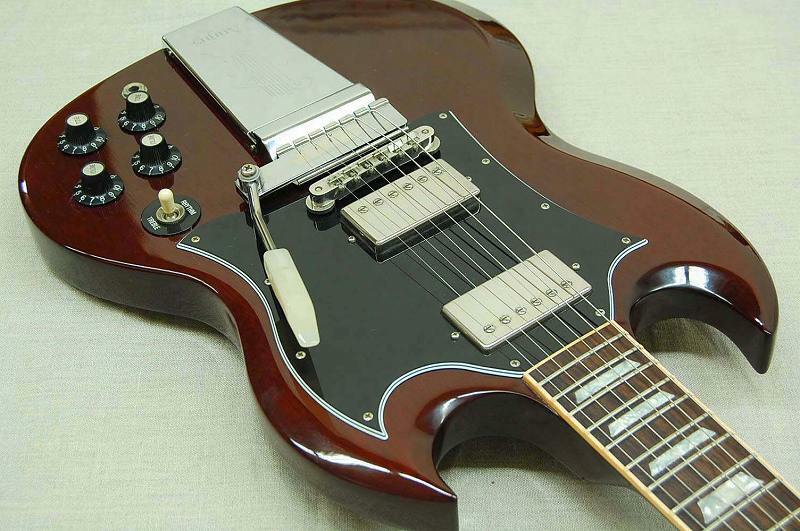 Guitar used here: an older Gibson SG Angus Young Signature, the first series, with an AY signature pickup in the bridge position. A nice guitar that eventually I sold as I already had some vibrolas SGs. The amplifier used here was an “Alessandro Beagle” head, 10 watts, 2 x EL84s, on my vintage 1969 4×12 1960A cabinet with original G12Ms in it. Still my best cabinet to this date. At the time, the cabinet had a non original red color. It was changed years later to green and now it’s being refinished into black (with original tolex). At the time, I used to record these simply putting my laptop a few meters away and hit record on its own audio application. No multitracks, nothing. Simple audio/video recording with the laptop own internal microphone. This song’s in the key of G. Chords G, C, D and Dsus4. This solo is beautiful, tuneful and melodic and is from the Gm pentatonic scale. For playing along with the album track it’s standard tuning. Great tutos! thanx a bunch! Man, that G to C to G is gonna take me a while to master ! Thanks! you’re good man =D. You should upload them to youtube to get more people, not the complete song, also the tutorial and youll get better quality than Vimeo. Grazie, te l’ho detto in passato e te lo ripeto, con te sto imparando a suonare, anche se non sono un principiante, imparo sempre sempre sempre, grazie! Thanks so much for putting these back up Fil. I got close to this by ear, but had no clue about “unbending” the strings (Bending from the bend back to the original note of that fret, if that makes any sense). Also, I missed several notes in those higher runs that take place up at the 15th fret or so. Thanks for this, now I can make my own video of me playing this tune correctly. Are these old tutorials still accurate? yes they are still accurate. Still the most accurate ones I ever found around, I ever saw, I ever heard off of anyone in the world except AC/DC. I have never, ever heard anyone get close to AC/DC as I did. I know, it sounds cocky, but I really am not a cocky person. I need though to say what I think, and this is it: I still think I can be easily identified as the most accurate AC/DC debunker in the world. This is also why I am reposting these: I still find them useful. I carefully reviewed them, re-listened to them prior to uploading them here, and yes, they’re still good. I WILL shoot an updated version of both though, right after Free Bird is done (in four weeks from yesterday). The NEW version will be right in your face, High Definition video and audio. Slower playing. More reference to the notes and chords. Some different detail here and there (individual notes). A few updates indeed, but the core remains the same. I will play the newer AC/DC tutorials with ALL of my vintage SGs, using them all for different parts across several tutorials of several AC/DC classics. I intend to tear the world apart. I’d like to hear the community’s thoughts on AC/DC tribute bands. Specifically Live Wire because they’re apparently the most accurate AC/DC debunkers in the world. I too welcome your desire, to hear people about tribute bands. The one I like the most is indeed Live Wire, who’s Bill “BonFire” we also have here among the members. Generally speaking however, I’m not too into tribute bands. They ARE good, and they fill a gap, but it’s very hard to sound like AC/DC. It’s hard for a single person, but it may even be harder for a group of people, as being more and more people complicates the musical and personal relations within a band and its sound. Live wire play come to play in the local club just down the road from where i live, about once or twice a year, it sells out everytime.